Parallel to the development of a complete KW transceiver with integrated low-pass filter and a 100W-PA based on the Red Pitaya module STEMlab 125-14, I started in May 2018 with the adaptation of my interface board to the OSA103 module of a Russian manufacturer. 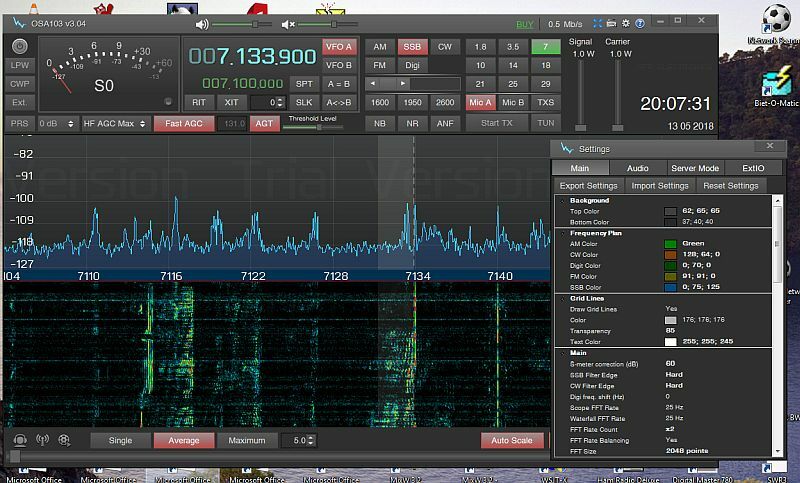 In contrast to the Red Pitaya module this module runs with the HDSDR software 2.70 and alternatively with the Zeus radio software 2.9.3. 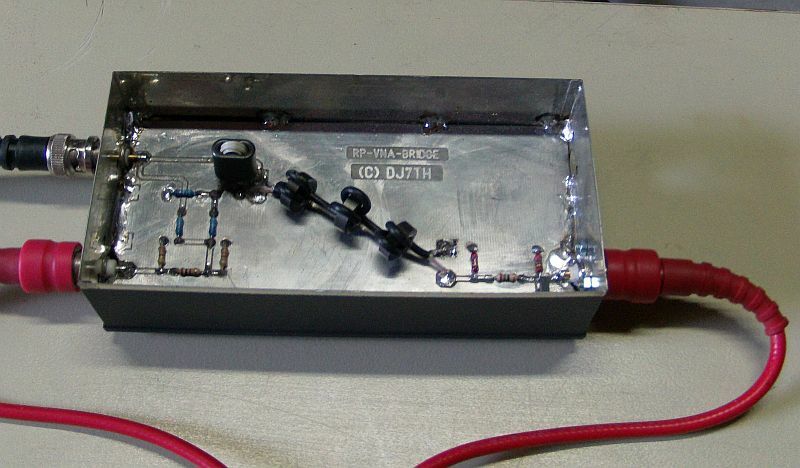 The OSA103 module has only one input and one output, but it can be used in the range of 150MHz, which I still have to test. 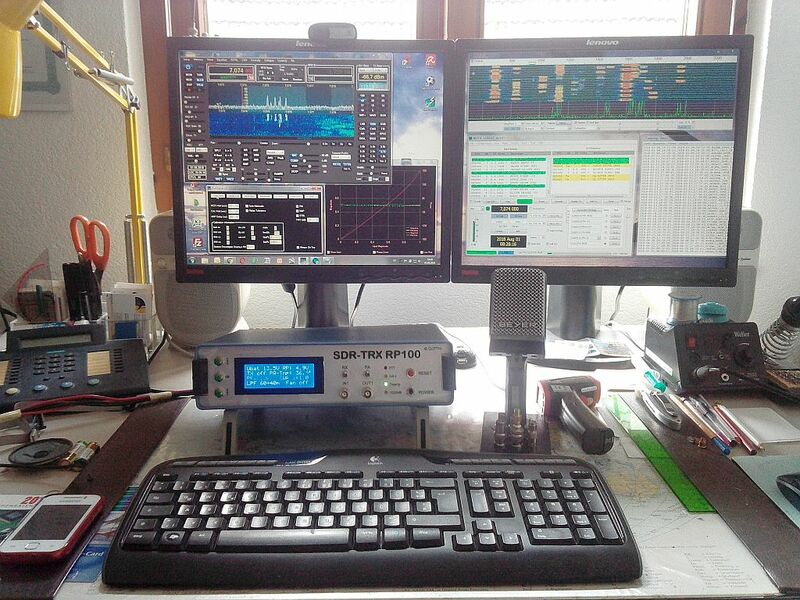 This SDR-TRX is also designed for 12V operation and is therefore well suited as a compact portable station thanks to its low weight. 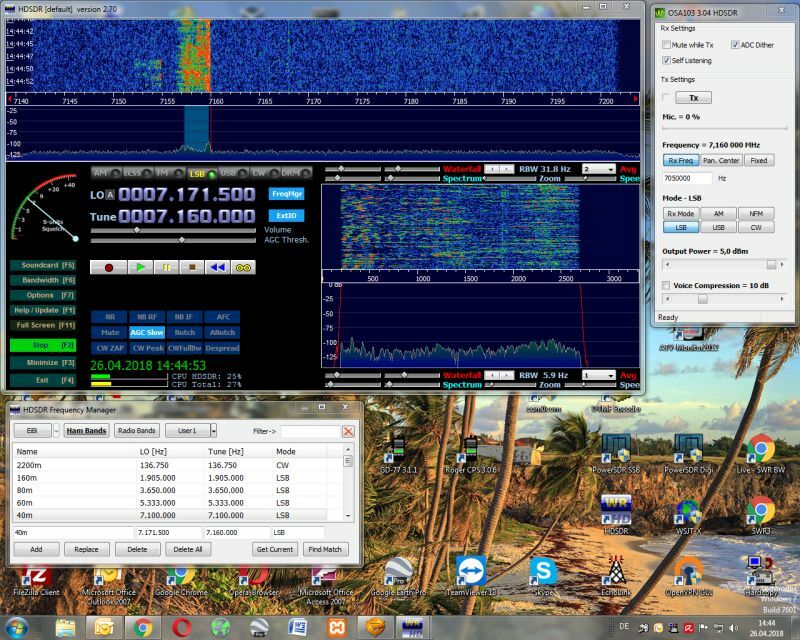 To control the OSA103 module it has to be connected via USB cable to an external PC or notebook, on which the SDR software is running. The Mike is connected directly to the TRX. Like the Red Pitaya interface, there's a broadband amplifier to increase the RX sensitivity. Antenna switching for antenna 1 or 2 as well as switching the 20dB attenuator are done manually on the front panel. The input and output of the OSA103 can be accessed via switch on two BNC sockets on the front panel and it can be used as network analyzers, oscilloscopes, etc. The LCD display has 4 lines with 20 characters each. With keys up-down-ok you can select various displays and monitoring functions of the PA. The wiring consists largely of flat cable connections, in addition, only wired components were used, which facilitates the replica significantly. 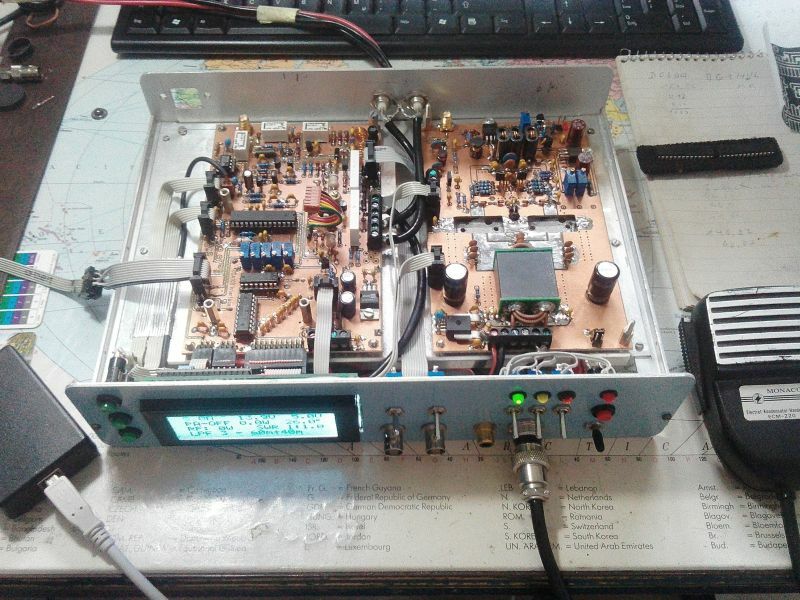 The 100W PA and the low-pass filter are the same as I'm using it in my Red Pitaya SDR TRX. In the PA output stage the proven 12V transistors RD100HHF1 (Mitsubishi) were used. The front panel and the case will be slightly redesigned. 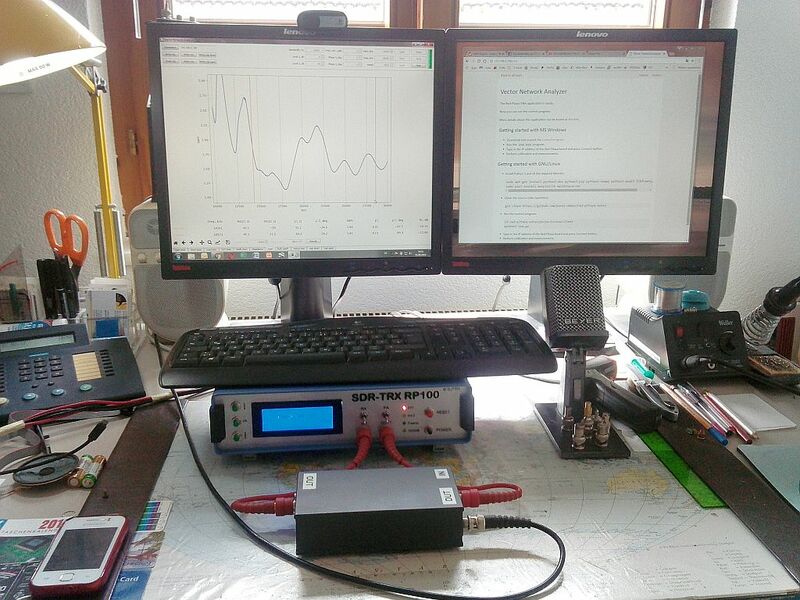 After the sucessful modification of my old TRS50S TRX into a SDR-TRX with the Red Pitaya module STEMlab 125-14, I decided in 2017 to develop my SDR TRX RP100 with integrated low-pass filter and a compact 100W PA with preamplifier and driver. 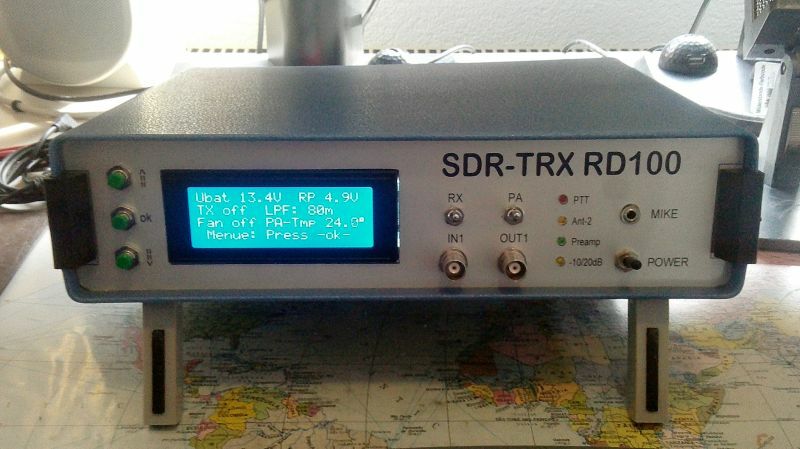 The SDR-TRX is designed for 12V operation and is therefore also well suited as a compact portable station thanks to the low weight of the aluminum housing. The TRX functions are controlled by Pavel Demin's Red Pitaya software in conjunction with the openHPSDR software, which runs in various versions on a PC, notebook, tablet or smartphone. For the local connection, I use the existing Ethernet network and my wireless router. 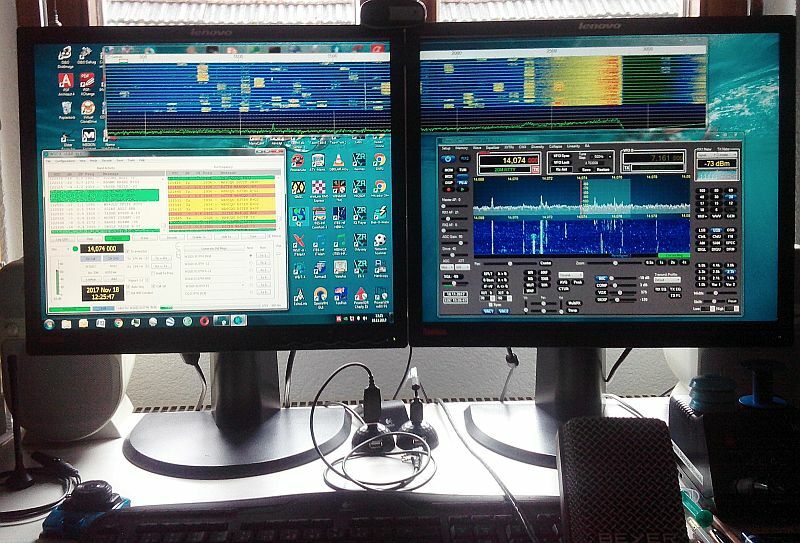 I can also remotely control the TRX. In portable mode, the connection is made via a directly connected 12V WLAN router and my notebook or my tablet. Depending on the size and processor performance, a smartphone is also suitable as an operating device, whereby I recommend the use of a headset. The picture shows my RD100 prototype TRX in test mode. The 4x20 LED front panel display is showing the operating states of the PA, which are detected and controlled by an Atmega328 CPU on the interface board. 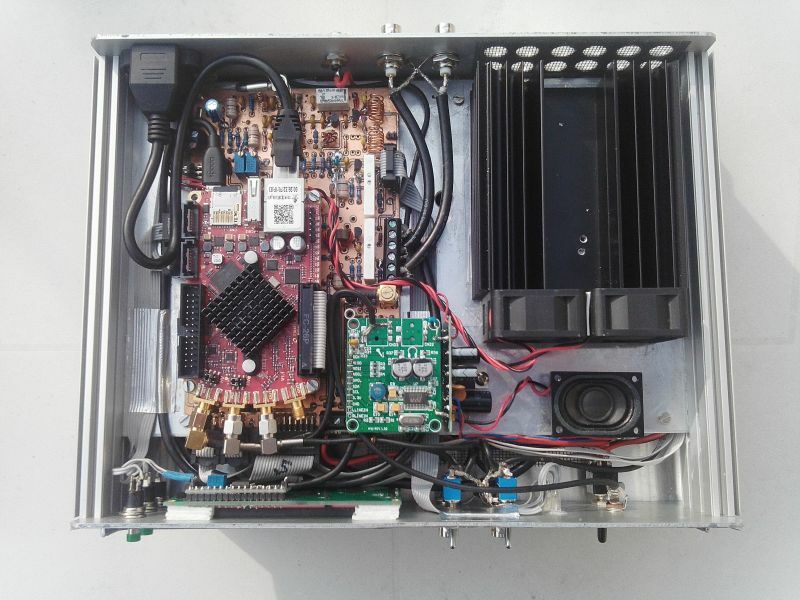 The BNC sockets on the front panel can be connected to IN1 and OUT1 of the Red Pitaya and can also be used for other purposes such as Vector network analyzer etc. On the back panel are two SDR software switchable antenna ports, an Ethernet port and a 12V connector. 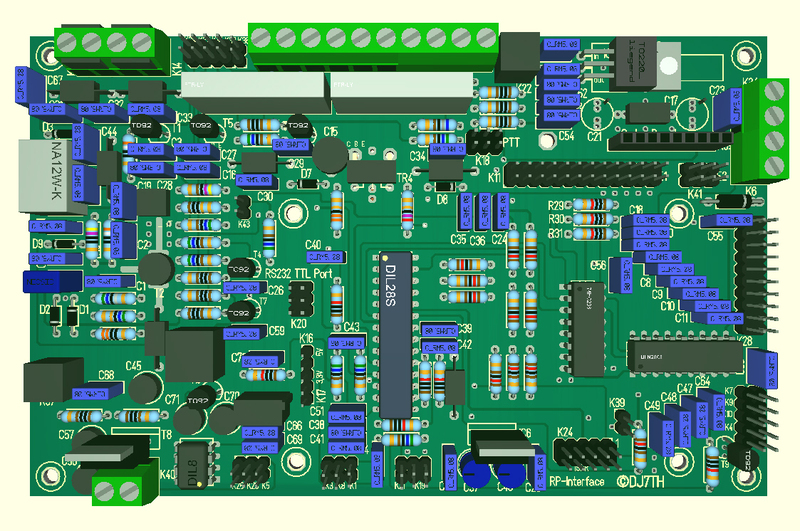 The circuit diagrams of the Interface-Board, the Lowpassfilter and the 100W-PA can be downloaded as pdf file. The installation of all components in a slightly larger housing with redesigned front panel is in work. The prototype boards were all made by hand and would later be commercially produced after successful test operations. To facilitate the replication, only common and wired components were used. On the left side the interface board with the Red Pitaya board and the Codec board attached,on the right the air cooled heatsink of the 100W PA and a small audio-amplifier + loudspeaker . The service-friendly wiring is carried out with pluggable flat cables or terminals and SMA connectors. The board is attached on the aluminum chassis by 4 screws. On the bottom side are mounted the 100w PA, the low-pass filter and the wiring with a 12V PA relay. The low-pass filter is controlled by the decoded signals of the Red Pitaya. The 12V power supply via a 25-pin connector on the back panel also allows a controlled external 12V supply of other devices (antenna tuner, etc.) by appropriate wiring. The signal connection of the interface board to the other boards and to the LCD display is made by plug-in flat cable, which significantly reduces the wiring work and sources of error (I hope :-). In the middle I placed the Atmega328A-CPU which I programmed with the help of BASCOM. The CPU monitors the operating states of the PA, supplies the values ​​to the 4x20-line LCD display as well as to an RS232 interface, controls the 12V PA relay and the PA board. 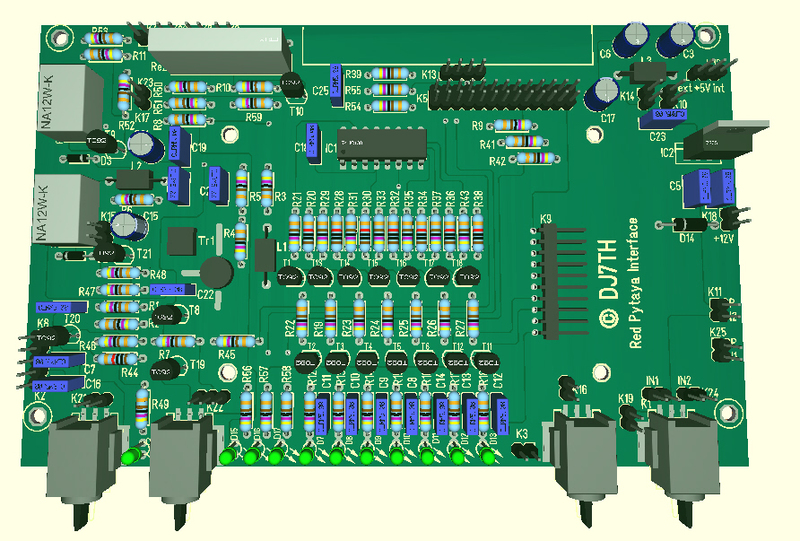 The Red Pitaya module is mounted on 4 standoffs and connected to the interface board via flat cable, also the Codec board in the upper right corner nearby to the 5V power supply. As can be seen in the diagram, are on the board a software switchable Rx preamp with a low-pass filter and a two-stage attenuator, the complete TRX switching with SWR metering and an antenna switch relay. The low-pass filter control signals of the Red Pitaya are decoded by 2 ICs and control the low-pass filter via a 10-pin connector. The LCD display with 4x20 characters shows: PA current, PA voltage (12V), RP (5V), Tx on/off, PA temperature, PA output power, SWR on the antenna connector, PTT on/off, the selected low-pass filter. In addition, limit values for PA current, PA temperature, PA 12V and SWR are monitored and, if exceeded, the PA is switched off and, as a precaution, disconnected from the 12V line via the relay until the Atmega CPU is restarted via reset or off-on switch. The limit values can be queried at any time via the menu with the three left keys, changed in specified ranges and saved again in the EEPROM of the Atmega CPU. Via an optional RS232 port on the interface board, you can externally display and evaluate the operating values. 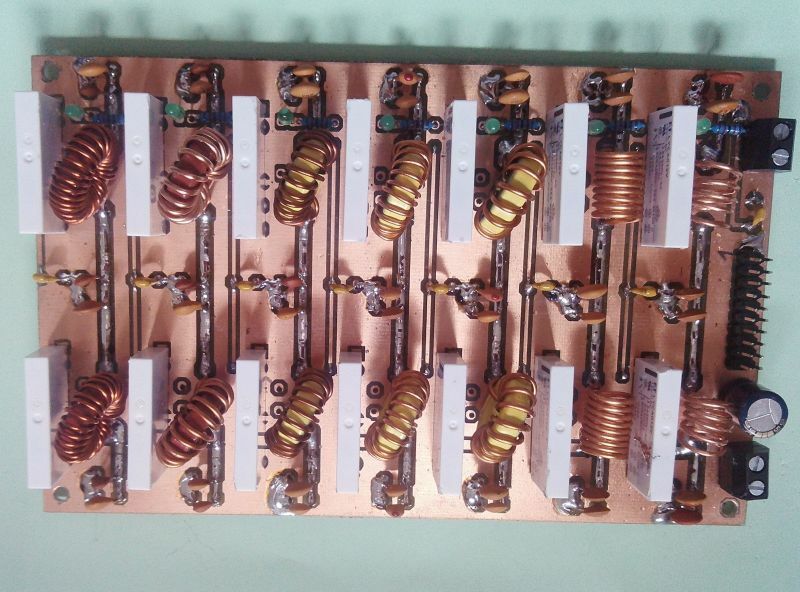 The 100W PA has been designed with 3 stages to boost the 10mW from the Red Pitaya to 100W Rf output. 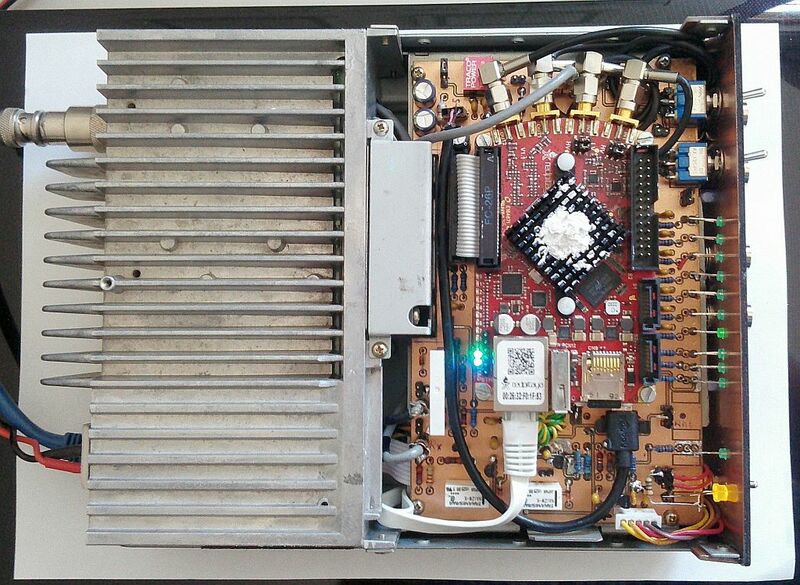 To monitor and display the power consumption, an IC type ACS756 (bottom right) is switched to the PA power supply and connected to the interface board along with other signals such as +12V and PA temperature. This allows to measure lossless currents up to 50A. Various jumpers are used for individual shutdown and adjustment of the bias currents of the PA and driver transistor. 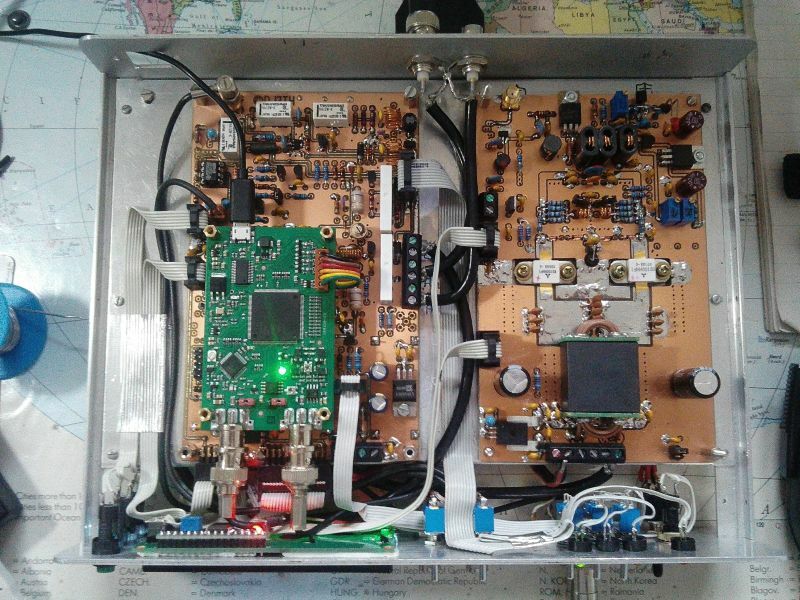 In the event of overloading or exceeding limit values, the interface board switches off the PA and the 12V supply of the PA.
With my additional external VNA adapter and the VNA-Software from Pavel Demin I measure the SWR of my Windom antenna. Inside view of my VNA-Adapter. Here the circuit diagram as pdf file. 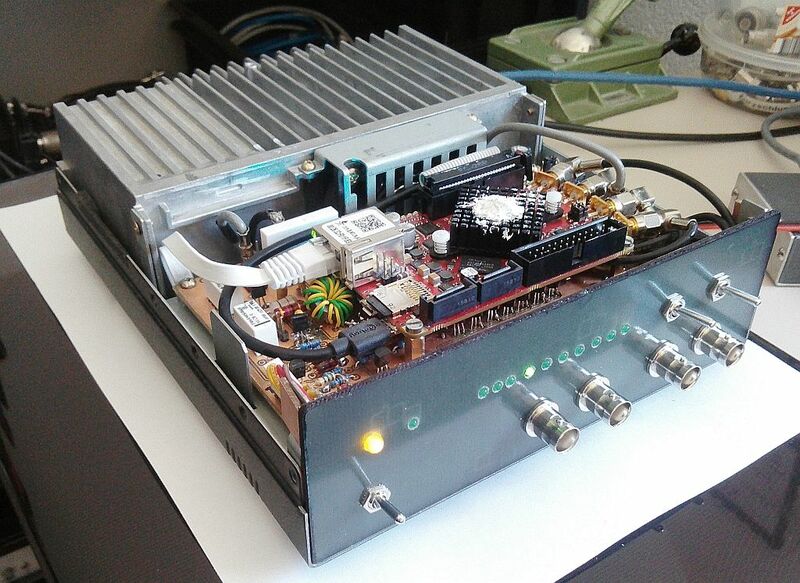 My disused KENWOOD TS50S RF-TRX was modified to a Red Pitaya SDR-TRX, after the removal of the partly broken RF and digital boards, using Pavel Demin's Red Pitaya firmware which is adapted to the openHPSDR software. I placed the Red Pitaya module with spacers on my interface board and connected it by a flat cable. Two flat cables on the bottom side connect the interface to the PA unit with low pass filter unit and the power supply of the TS50S. The original front panel of the TS50S has been replaced with a simple one of epoxy material. The 4 BNC sockets can I switch to the inputs and outputs of the Red Pitaya module. The LED row indicates various operating states and the software selected low pass filter. The LAN socket sits on the back wall. There are also the original antenna and 12V connectors. My interface board has the size of 100x160 mm and 2 layers. As can be seen on the circuit diagram (pdf-file) the control signals of the Red Pitaya are connected to socket E1 and generate the signals for the on/off control of the preamp, PTT and the low-pass filter relays of the TS50S, decoded by an IC type 74HC238. 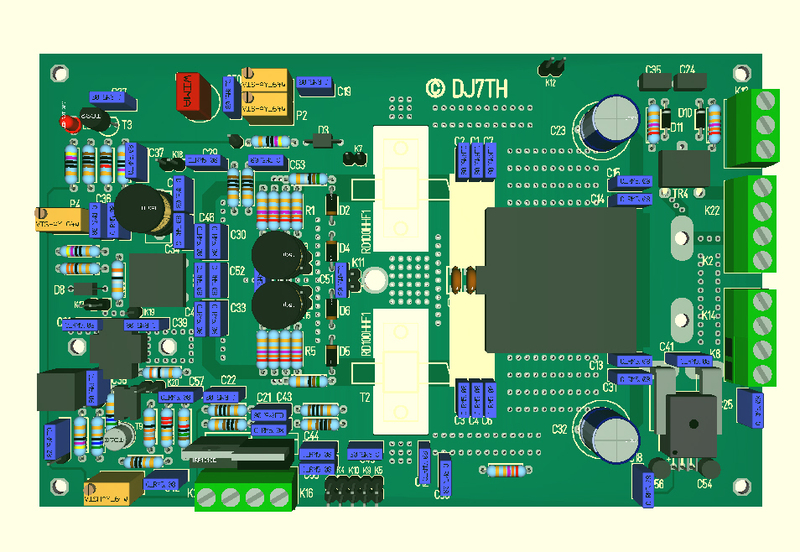 A 5V low noise switching regulator supplies the board and the Red Pitaya via a USB cable. A software controlled RX preamp increases the low RX sensitivity of the Red Pitaya input. The two RX inputs of the Red Pitaya are switchable to the BNC connectors, so I can use the Red Pitaya for other purposes, such as a vector network analyzer. 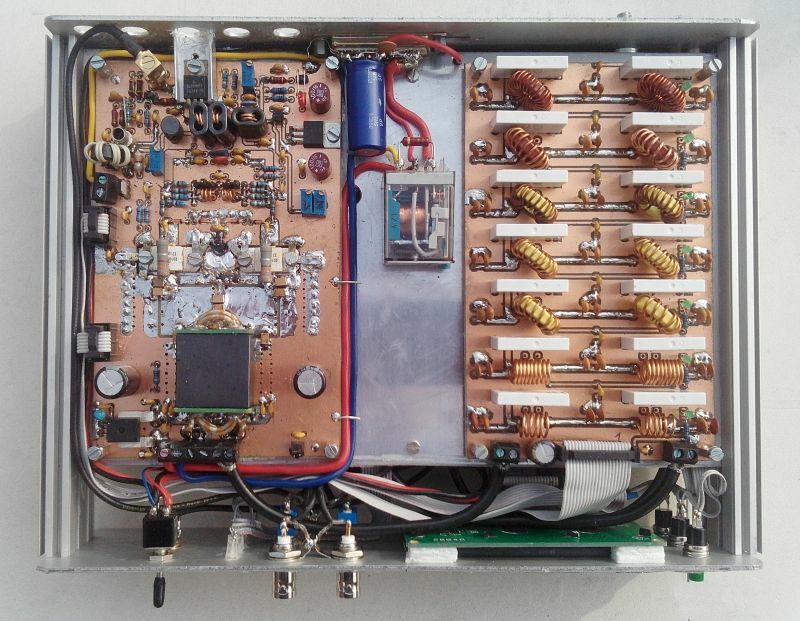 There is also a switchable RX attenuator, as well as an optional antenna relay for switching between two antennas, both can be controlled via SDR software.